Email newsletters are a necessary component of doing business these days. Everyone should have a mailing list (you do have a list, don’t you?) and send out periodic messages. The content of those messages could be anything from your top new blog posts to promotional materials. Everything should be based on the needs of your organization. Regardless of what you send, everyone faces the same main challenge: Entice people to open up your message, read it and interact. That’s the holy grail of email marketing. And, that’s where a great newsletter template can really make a difference. Your template needs to match your brand. So the visual elements like colors and images should look like they came from your company. Ideally, you’ll want a template that lets you easily customize the look so that you can get things just right. It should also fit the type of content you typically send. Clean and simple is the way to go. The goal is to emphasize your content – not the fancy imagery of your template itself. A great template gets out of the way when it comes to content presentation. That means it’s usually best to avoid templates that are a bit overbearing. With those simple rules in place, here are 10 newsletter templates that will help you to better engage your customers. Note that many of these selections support one or more WYSIWYG builder tools from a third-party service provider. This allows you to easily personalize the look and layout to fit your needs without having to dig into code. We’ll note which services are supported where appropriate. E-Shop is a modern, attractive template that features a responsive layout. While not necessarily minimal, it uses great typography and whitespace to create a newsletter that is easy to read. It’s been Litmus tested with the major email clients (including Gmail, Yahoo, Thunderbird & Outlook) and is compatible with top services like MailChimp, StampReady (which allows you to export your customized template) and Campaign Monitor. Kappa is a collection of 12 responsive email templates and also includes access to a drag-and-drop builder. Templates are built for a wide range of industries and contain several well-designed modules. Each element of the template is fully editable and a layered PSD file is also included. You’ll be able to easily integrate the template with MailChimp, Campaign Monitor, iContact and AWeber services. It has been Litmus tested for compatibility with email clients. AMO features compatibility with the StampReady builder, MailChimp, Campaign Monitor and the MyMail WordPress plugin. With a maximum of 3 columns and a plethora of included modules, the responsive layout is clean and designed with business in mind. The template has been Litmus tested with major email clients and web browsers. Stella aims for flexibility. Choose from a light or dark skin and find the perfect colors to match your brand. It also includes over 80 modules to help you customize the layout and content to a perfect match. You’ll also find StampReady builder access, compatibility with MailChimp, iContact, Campaign Monitor and more. A PSD file is included for extra tweaking. The template has been Litmus tested. 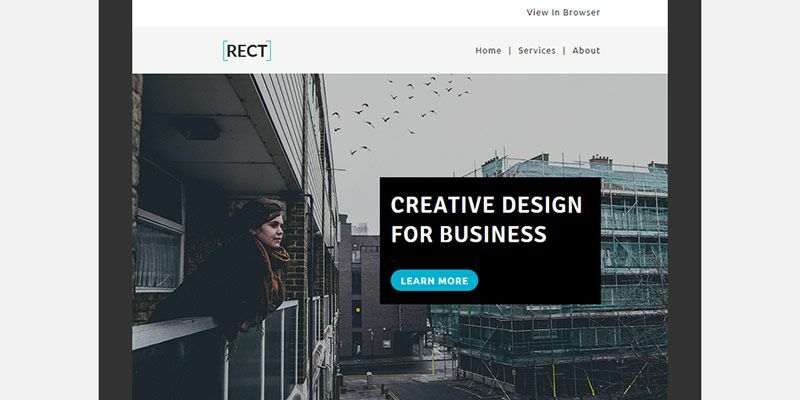 RECT utilizes subtle graphical elements and strong typography to help content stand out. Under the hood you’ll find well-commented HTML – helping to guide you in making changes manually. It also supports StampReady builder, Campaign Monitor, MyMail for WordPress and MailChimp. The template is Litmus tested and will work with major email clients and web browsers. Farbe sports a unique design that makes great use of tinted photo backgrounds. They’re not overwhelming – just simple images that create a layered look. Customizations can be made through the StampReady builder and you’ll also find that the template is compatible with a long list of service providers. It also supports the native mobile apps for Gmail, Outlook and Yahoo. Jackie Mail comes off as a bit more minimal than many templates out there. That makes for great readability. Since it’s responsive, those properties also transfer nicely to mobile devices. The theme is ready for use with Campaign Monitor, iContact and MailChimp. You can also do some drag-and-drop editing via StampReady. A PSD file is included. Astral carries a beautiful simplicity in its design, but it packs options galore. With 200 readymade modules and 15 different layouts (each with its own included PSD file) – you have a lot of freedom to experiment. The template is Litmus tested and works with both Campaign Monitor and MailChimp. Drag and drop your way to customization with the Kbuilder WYSIWYG app. Vera features a clean, uncluttered layout with 20 modules you can use with the StampReady builder. It is Litmus tested with all the major mail clients and is compatible with both MailChimp and Campaign Monitor. Background images are supported in Outlook – which not every template can boast. That’s a good thing, because this template makes great use of them. A PSD file is included with the package. Magazine works with the Kbuilder WYSIWYG app and includes attractive modules – including a nifty grid layout to help your blog’s content stand out. You’ll find four layouts and respective PSD files. The template is Litmus tested and compatible with both Campaign Monitor and MailChimp. There’s definitely a subtle science to creating great email newsletters. It takes a combination of compelling content and a look that helps to get a user’s attention. Without that balance, you’ll find it difficult to improve conversion rates. The templates above can be a great help in striking that delicate balance. The fact that they can be easily customized and include readymade content modules simplify the whole process. From there, it’s just a matter of adding in your own top-notch content.